There are some rough spots in the sidewalks along Main, but the area is already vibrant. I don't see how ripping out curbs/sidewalks that are less than six years old and in good condition will increase vibrancy in the district. Again, that's not true even of the corners of the intersection, let alone the entire sidewalk on the west side of Main. Also - though no one has claimed that this project will increase the area's vibrancy, improving pedestrian safety is kind of an important part of whether people will want to walk in an area. I was thinking of some rough spots in the public sidewalk on the east side of Main. The sidewalk at the southeast corner of Cameron and Main is smooth, safe, and it's in nearly perfect condition. The curb ramps there are designed and constructed well, as opposed to the curved curb ramp one block to the south. Instead, why not replace some sidewalks that are in poor condition? Or why not build new sidewalks for pedestrians along streets where there aren't any sidewalks or where segments of old sidewalks are missing? Replacing sidewalks in poor condition and completing our sidewalk system are also important. No one has argued otherwise. But this design change is also important, and signals a shift in the mindset behind our street design in pedestrian-oriented areas. The sidewalks and curbs at the southeast corner of Main and Cameron were re-built a few years ago. The curb line was moved. The existing curb ramps there are well-designed. What I'm suggesting is for that particular corner to remain as it is. Bump-outs and neck-downs are okay with me, but if the southeast corner stays as it is and the southwest corner is revised as the drawings indicate, then the distance across Main from curb to curb will be reduced to about forty feet at the crosswalk, like it has been reduced at Boston Avenue, one block to the east. In my opinion, it's not difficult or unsafe to walk across Boston. It's only forty feet between curbs, and vehicles are supposed to stop. I know some drivers ignore stop signs, but most drivers do stop and do yield to pedestrians. Moving curbs is relatively expensive. The curb at the southeast corner of Main and Cameron was moved a few years ago. Rather than moving the curb again, I'd rather see the money spent on the other side of intersection, where there's no sidewalk at all -or- at other locations to repair sidewalks that are broken/unsafe. The sidewalks and curb ramps on the southeast corner of Main and Cameron are not unsafe for pedestrians, whereas other locations nearby are unsafe. Maybe in anticipation of the fixtures being donated? With luck, they will be warm-white shielded fixtures that will add a welcoming, low-glare ambiance to the street (as opposed to a sickly-blueish glare bombs seen nearby). Thanks for the links, buffalodan! It's nice to see fixtures that will direct light downward, instead of glaring acorn lights. One day I want one of you crazy light guys to have a beer with me and show me what you see in light plans. I still don't understand all this. I think we all could benefit from a lighting lesson from patric! Happy hour and lighting discussion?? Buffalodan, here's the illustration they're referencing. They look similar to the lights installed in the Brady Arts District in recent years, which point light (mostly) down toward the sidewalk instead of up and out (like the acorn lights along Boston Avenue). 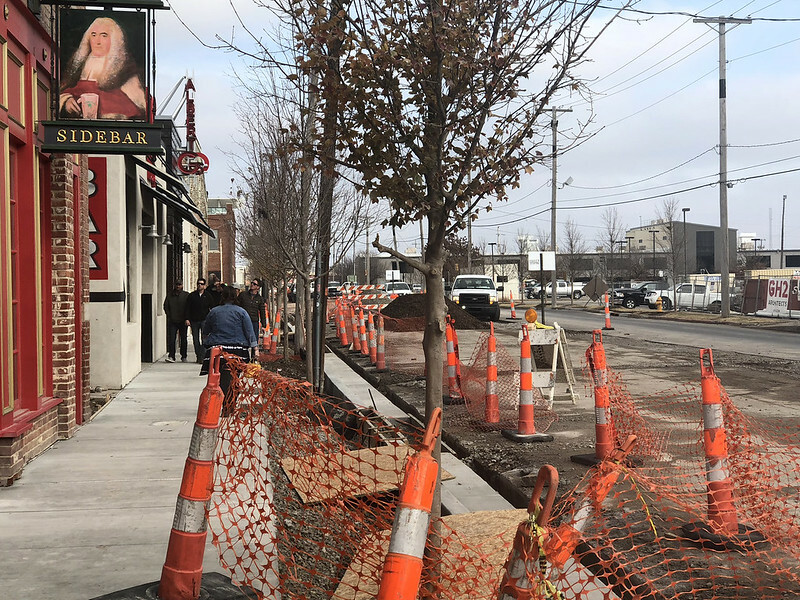 First Street is being reconstructed, and as the plans showed, the sidewalks in front of McNellie's and Albert G's have not been widened. The City is moving forward with its original vehicle-oriented design. Truly a missed opportunity to improve the environment for people on foot and make the whole area more friendly. The sidewalks here are already too narrow, and the problem will only get worse as the area's popularity and foot traffic ticks up. Philips Luxeon LEDs come in the warmer 3000K color, why did someone decide on the colder, bluer, less inviting 4000K that other cities have had to replace due to public protest? The choice of fixture is much better than we would have seen a decade ago, FWIW. The bluer 4000K fixtures are marketed as having a slightly higher lumens-per-watt efficacy but in the grand scheme of things the difference doesnt matter as much as the cold/warm appearance. Have you thought about reaching out to the engineer that signed the drawing? They may be able to offer some insight into the "why" and offer a way to change it. Often in the past its been the vendor that decides what the city should buy (by way of marketing) but thats a thought.